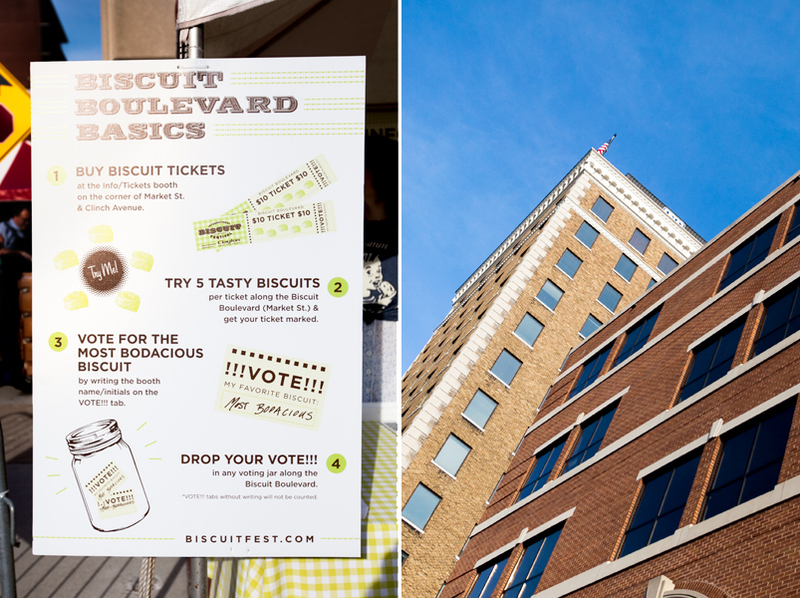 It’s May, and that means the return of one of my very favorite local food events – Knoxville’s International Biscuit Festival! 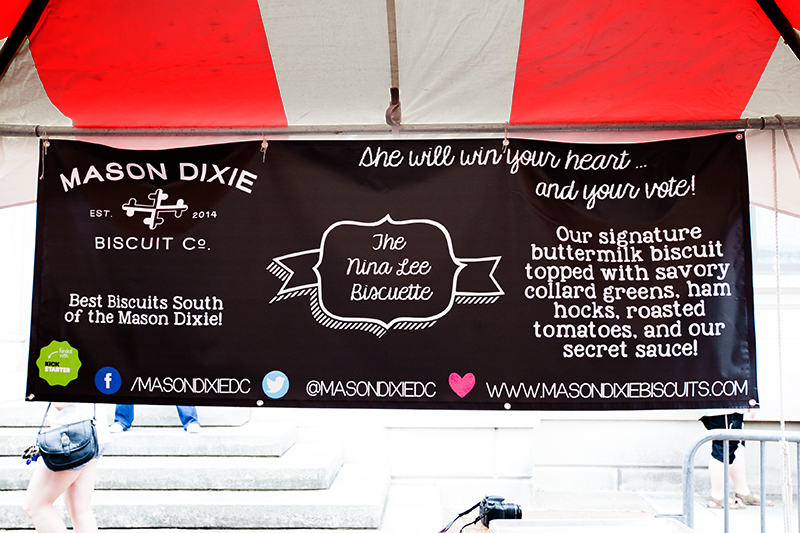 Started in 2009 by a group of biscuit lovers, the celebration has grown exponentially into a nationally recognized food festival. 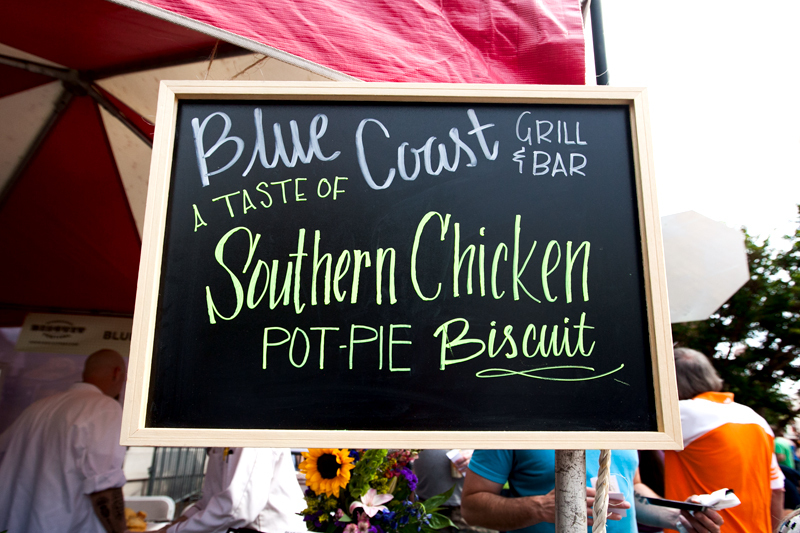 The entirety of the festival takes place over the course of 3 days and includes food and art competition, pageants, local entertainment, and shopping all centered around one of the most loved southern foods, the biscuit! 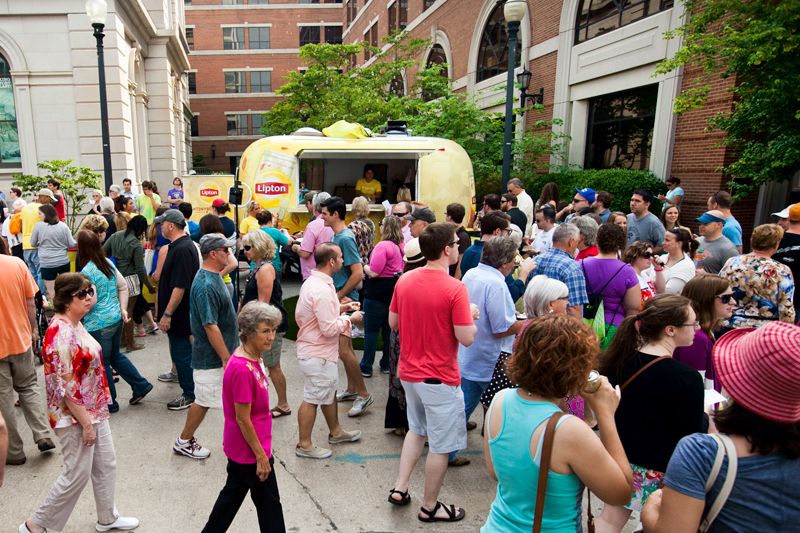 Biscuit Boulevard, taking place the last day of the festival, draws the biggest crowds. 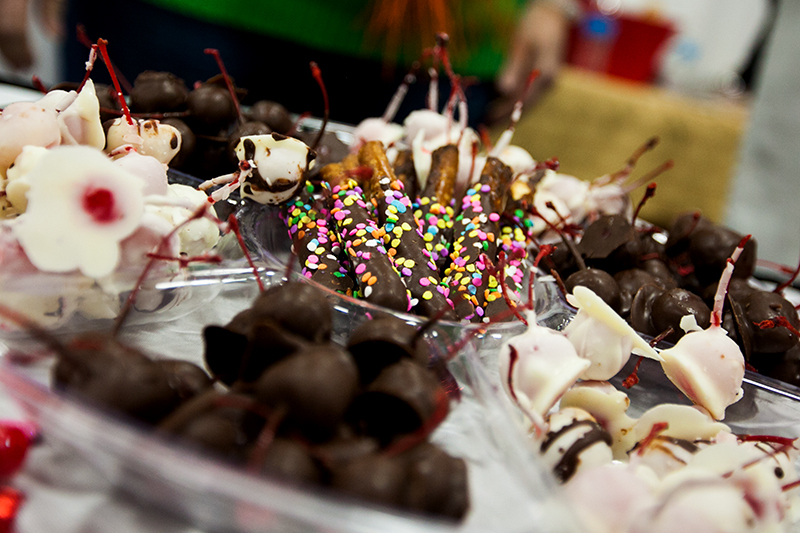 The region’s finest restaurants and bakers create unique biscuit creations to share with the people for two reasons – to create a community bond through a love of biscuits and to compete for the coveted People’s Choice award! We met up with our bestest friends and fellow food bloggers, Kara and Remington, bright and early on Saturday and motored to Downtown Knoxville for a morning of carb-loaded heaven. 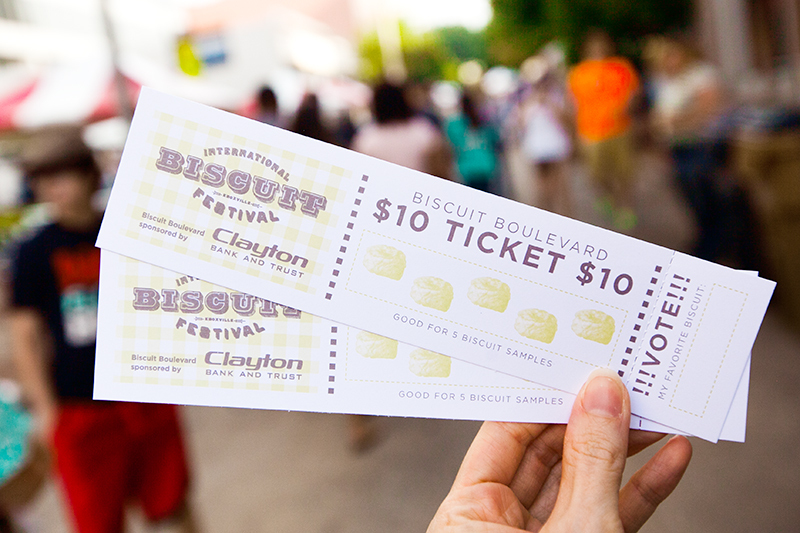 As of 2015, each ticket to Biscuit Boulevard costs $10 and allows you to choose 5 biscuits to sample. 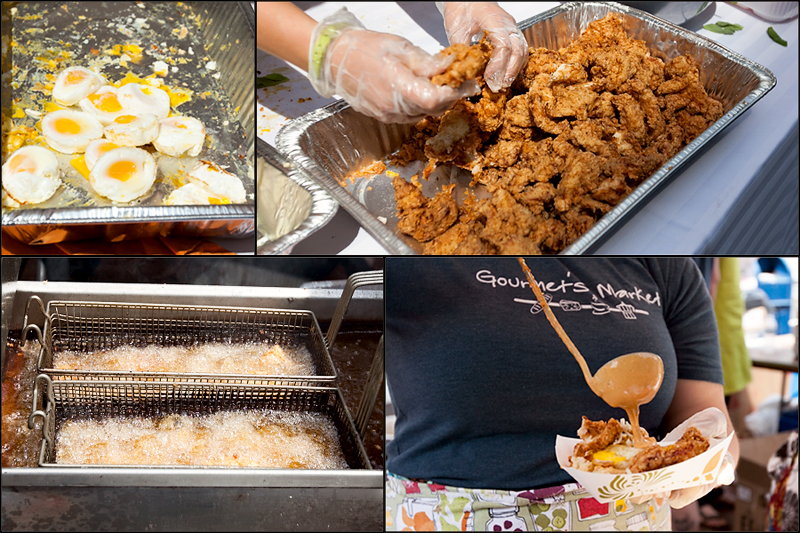 Bring your appetite, because the “samples” are full-size biscuits, often loaded with other toppings such as fried chicken, eggs, gravy, sausage, etc. Matt and I buy two tickets and share everything to maximize how many we’re able to try. The rules are pretty simple. Step 1: Approach the booth whose biscuit you want to sample and have your ticket marked. Step 2: Consume biscuit. Step 3: Repeat steps 1 and 2 until your ticket (and your stomach) are full. Step 4. Tear off the voting stub and drop it into the voting jar of the booth you think had the tastiest biscuit! The festival has grown extremely popular over the last few years and brings in quite the crowd of locals and tourists alike. I absolutely love living in Knoxville. It is far from a small town but is also not a large city. 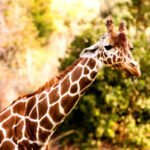 It’s a perfect size to have a community feel but also have most of the conveniences of a larger city. We’re also barely an hour away from the Smoky Mountains, the most visited national park in the country. Yep, I’m quite content with our choice to live here. But anyway, back to the biscuits! 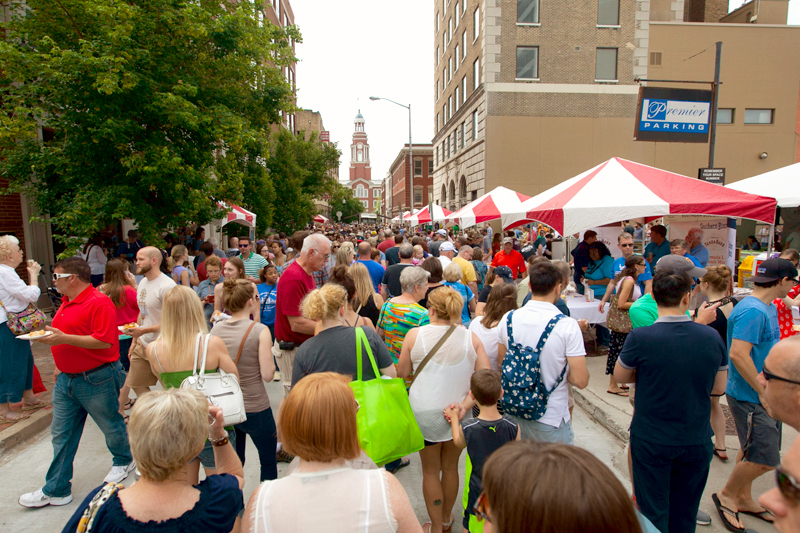 This year the festival was no different in its level of popularity and people filled the streets of downtown Knoxville ready to indulge in interesting recipes of one of the most quintessential parts of Southern fare. Oh, and see the Lipton truck up there? 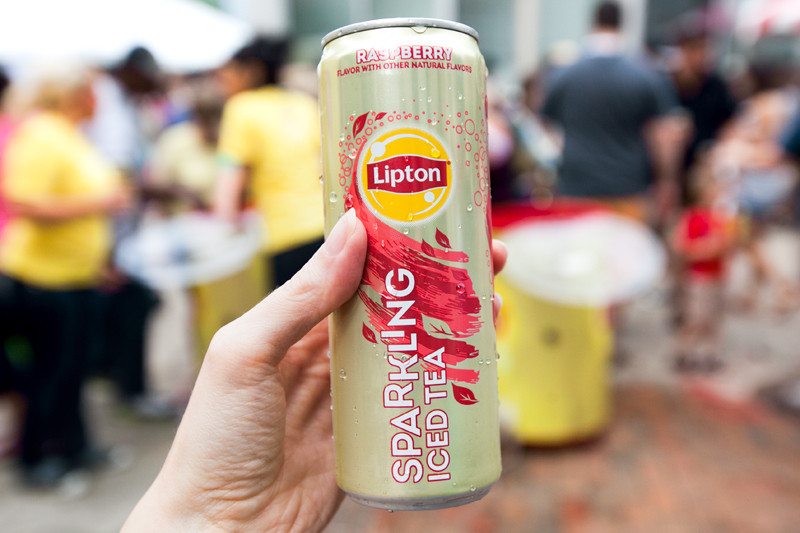 They were handing out free samples of cold sparkling iced tea in three flavors – raspberry, lemon, and peach. It was a balmy Spring morning so these were a much-appreciated refreshment. Thanks, Lipton! 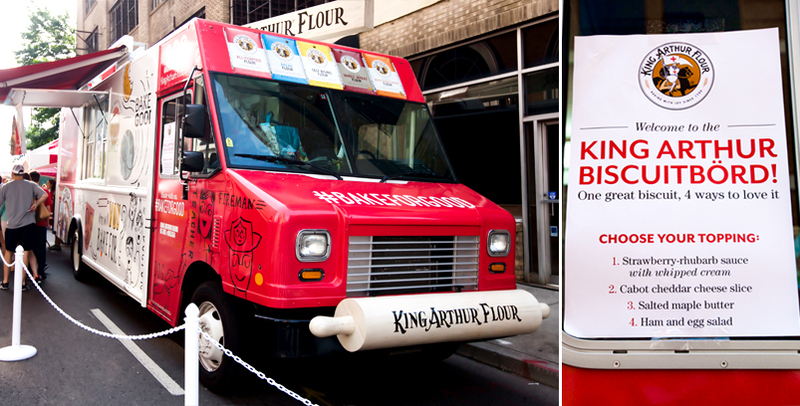 The first vendor we visited was the King Arthur Flour Bake for Good truck. This food truck travels all over the country sponsoring baking contests and visiting food festivals with a simple mission of connecting people through a love of baking. Their biscuit was offered with a choice of four toppings: strawberry-rhubarb sauce with whipped cream, cabot cheddar cheese, salted maple butter, or ham and egg salad. I looove the combination of strawberry and rhubarb and though the salted maple butter topping was mighty tempting, we went for the fruity choice! 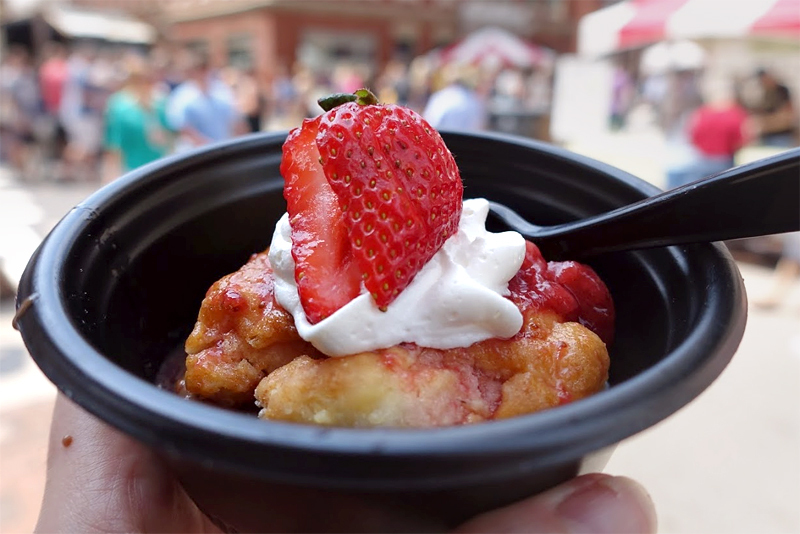 It was tart and sweet with big ole chunks of strawberry – a refreshing way to kick off the 2015 festival. 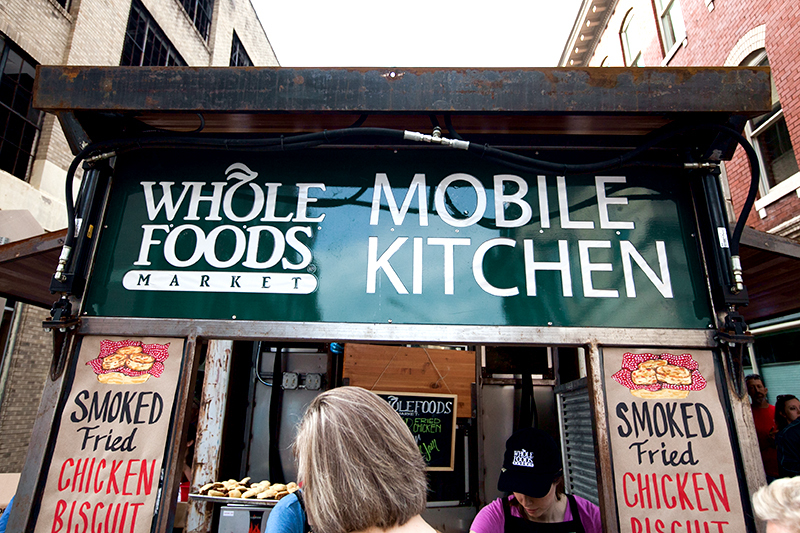 The next stop was the Whole Foods Market Mobile Kitchen. Knoxville finally got a Whole Foods a couple of months ago and the locals are pretty stoked about it! 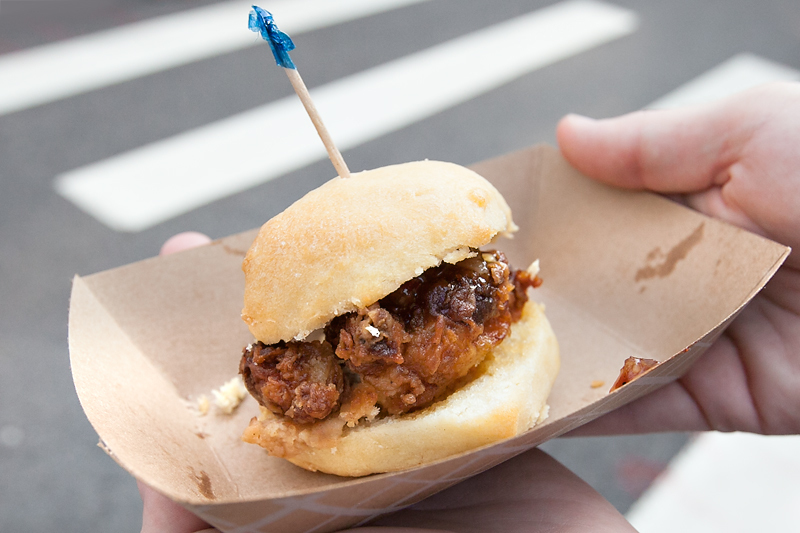 Whole Foods offered a smoked fried chicken biscuit with a tasty red pepper bacon jam. I love pepper jams of any kind! Have you tried them? If not, you should. It’ll change your life. The chicken had a dark smoky flavor that paired well with the bite of the jam and the sturdy, chewy biscuit. 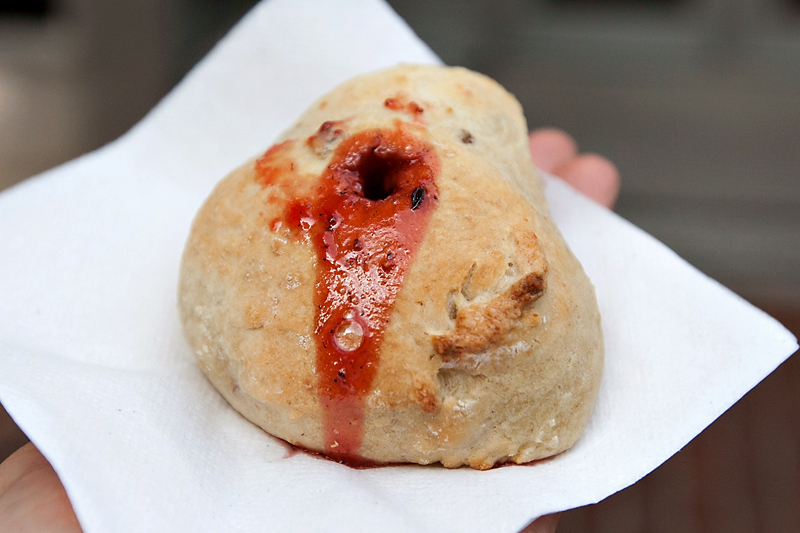 Next we chose a local participant – The Tomato Head/Flour Head Bakery. The Tomato Head is a well-loved local place serving up absolutely delicious pizza, and they have recently expanded with The Flour Head Bakery which offers up artisan breads and other baked delights. 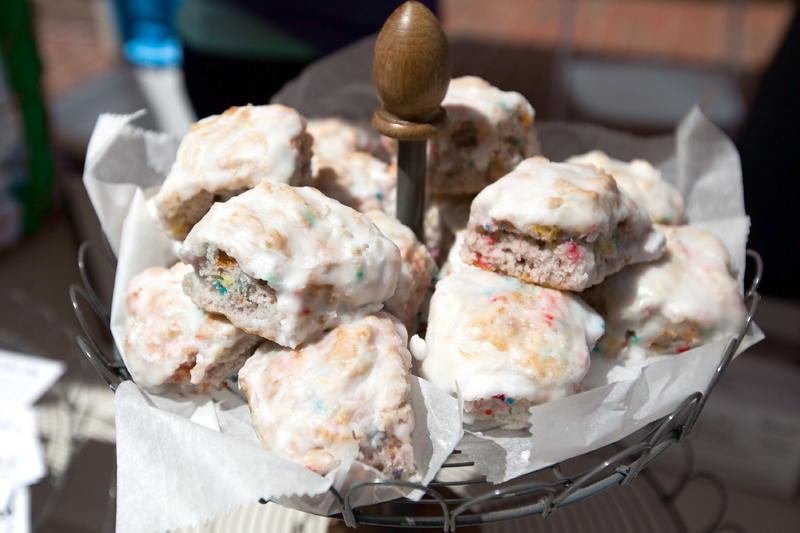 Their biscuit was named The Jewel. It started with a buttery, tender, and fluffy biscuit topped with a hearty combo of ingredients that included molasses mayo, cheese, Benton’s sausage and roasted collard greens. My favorite type of biscuits are the ones that are loaded with toasty buttery flavor but are so tender cloud-like that they almost melt in your mouth. 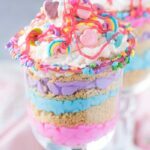 The Jewel delivered on both of those things and with that flavorful concoction of toppings…. delicious, just delicious. 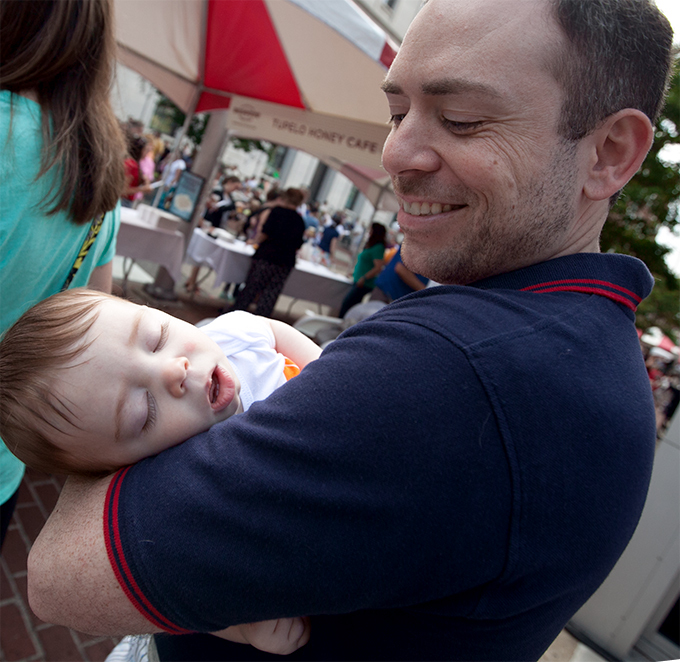 Our newest biscuit connoiseur isn’t quite old enough to participate in the tastings, but Jasper was very patient with us while tagging along for his very first International Biscuit Festival. One day he’ll get to really join in on the fun and help mommy and daddy choose the best biscuit! 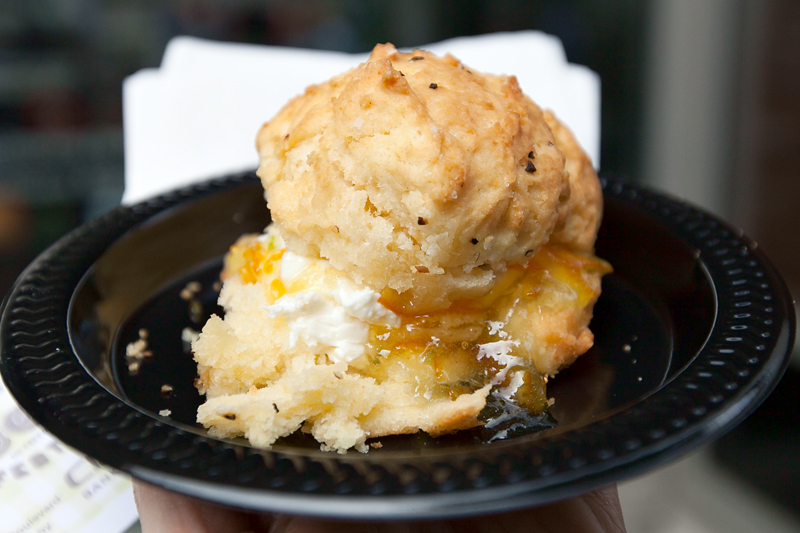 We knew we’d better line up early for Tupelo Honey Cafe’s biscuit – it is one of our favorite restaurants and they always bring their A-game to the BiscuitFest. 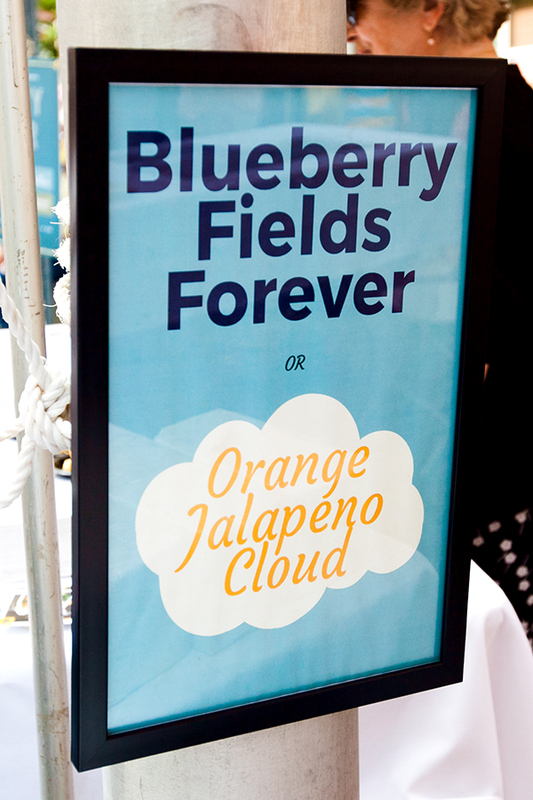 This year’s choices included biscuits named Blueberry Fields Forever or Orange Jalapeno Cloud. We chose the latter for two main reasons: first, I am familiar with the combination of Tupelo’s signature biscuit with their homemade blueberry compote and wanted to try something new, and second, omg orange and jalapeno?? That combination sounds heavenly. Sign me up. 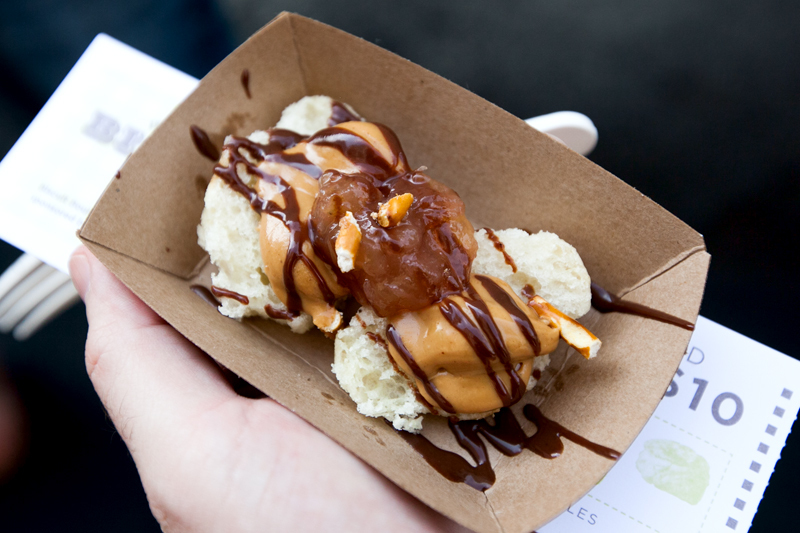 Orange Jalapeno Cloud was filled with whipped cream cheese and an orange jalapeno marmalade that’ll knock your socks off. 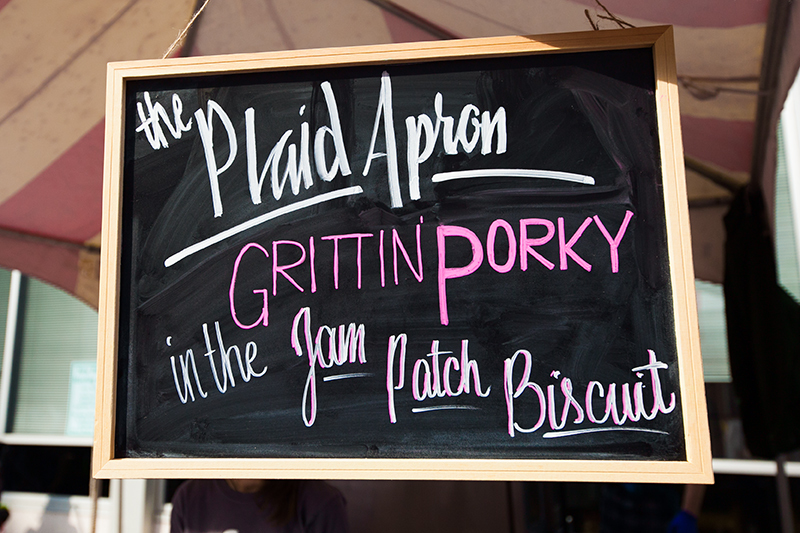 The Plaid Apron, another local favorite, was serving up a biscuit with a very fun name – Grittin’ Porky in the Jam Patch – ha! Grittin’ Porky in the Jam Patch was injected with a fresh jam filling that oozed out of the top. 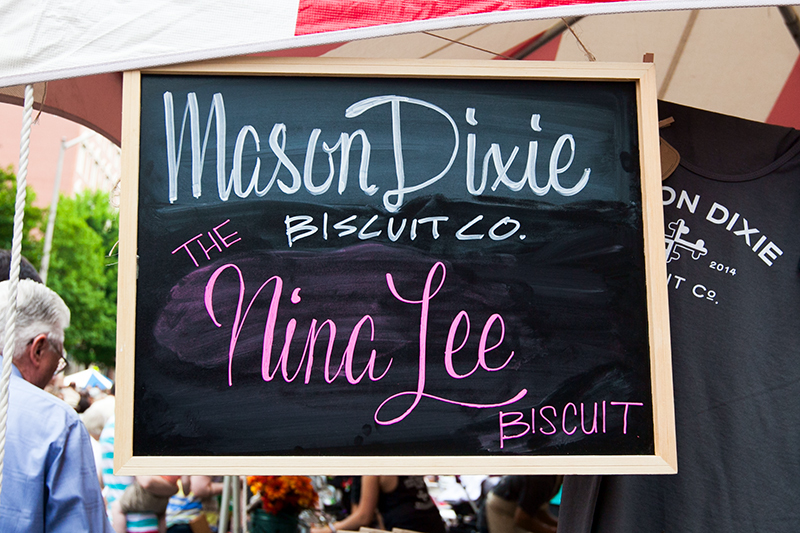 The Mason Dixie Biscuit Co. came all the way from Washington D.C. with their Nina Lee biscuit. 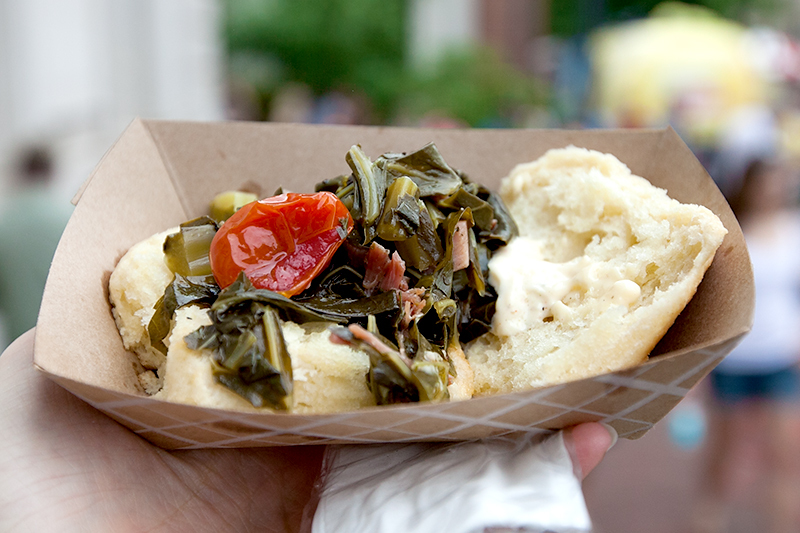 Proclaiming to have the best biscuits south of the Mason Dixie, the Nina Lee was composed of their signature buttermilk biscuit topped with savory collard greens, ham hocks, roasted tomatoes, and a secret sauce. I love both savory and sweet biscuits and you can never go wrong with the classic southern combination of ham hocks and collard greens. The roasted tomato and secret sauce really rounded out the flavors – it was yummy! 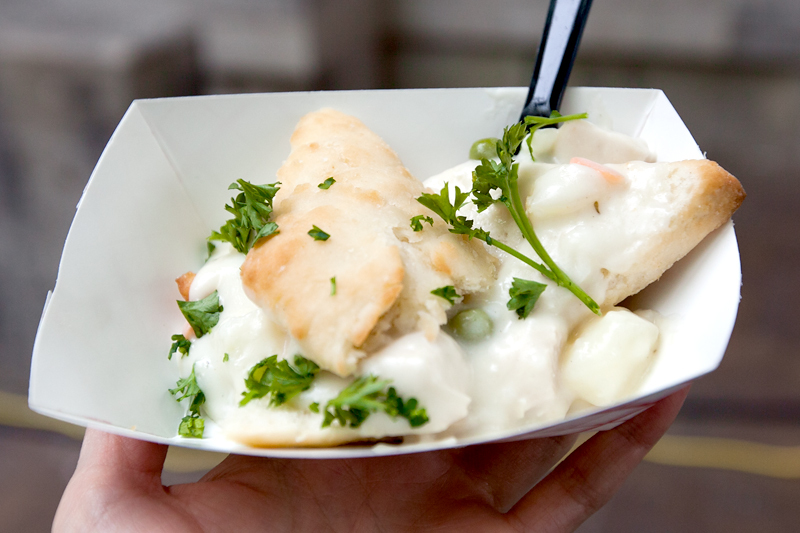 Blue Coast Grill & Bar, a restaurant serving up New American Cuisine in Knoxville’s Market Square, showed up with the Southern Chicken Pot Pie Biscuit. Their biscuit was topped with a classic chicken pot pie base with peas, carrots, potatoes, and chicken and garnished with sprigs of parsley. Chicken pot pie is so versatile, you can use just about anything for the “crust”. I’ve had pie crusts of many different types, puff pastry, and even chicken pot pie soup, but never a full on biscuit. Makes total sense to me! Biscuit Love competed with The Gertie – an angel biscuit topped with peanut butter, caramelized banana jam, chocolate gravy, and crumbled pretzels. 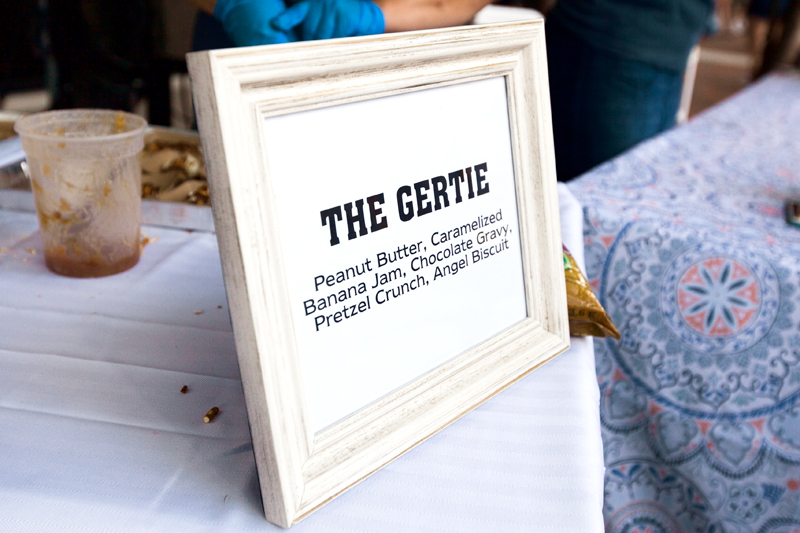 One of my very favorite parts of the festival is getting to try some unique toppings or ingredients included in some of the biscuits, such as the caramelized banana jam used on The Gertie. Though the term “foodie” has gained some negative and pretentious connotation over the years, I have to admit that I am totally guilty of being one. I will try anything once and get ridiculously excited over the chance to try new things. Food is just so darn FUN. The Gourmet Market is a cute kitchen-lovers retail shop located in Knoxville’s Bearden district. 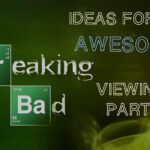 If you love to cook or bake, you should check it out. It’s a fun shop to browse and they have such neat, unique, and hard-to-find gadgets, ingredients, and other fun culinary items. 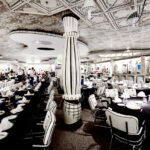 Attached to the market is Cosmo’s Caffe where we have had many delicious breakfasts. 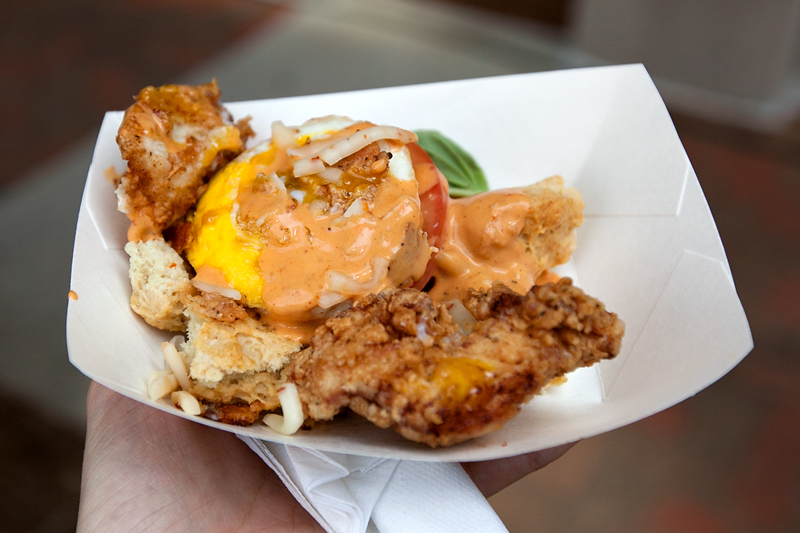 Their competition biscuit, The Big Nasty, was a crunchy cathead biscuit topped with spicy fried chicken fried on-site, topped with a poached egg and then finished off with some ghost pepper cheese, chipotle cream sauce, a slice of tomato, and a basil leaf. Remember what I said about loving to try new things? The Big Nasty definitely had some fun flavors going on and had one of the longest lines at the festival. 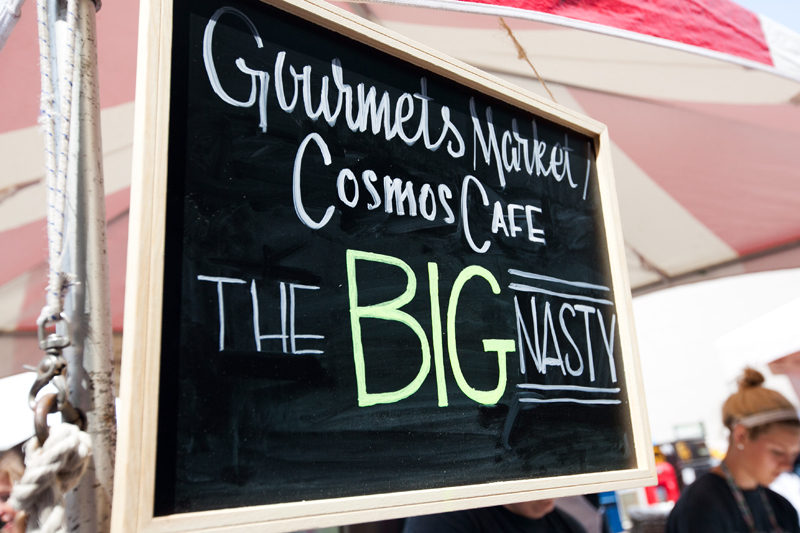 A little birdie told me that The Big Nasty is going to make its way to Cosmos’ official menu in the near future, so if you missed the festival and want to give it a try, head down to Bearden to The Gourmet Market! 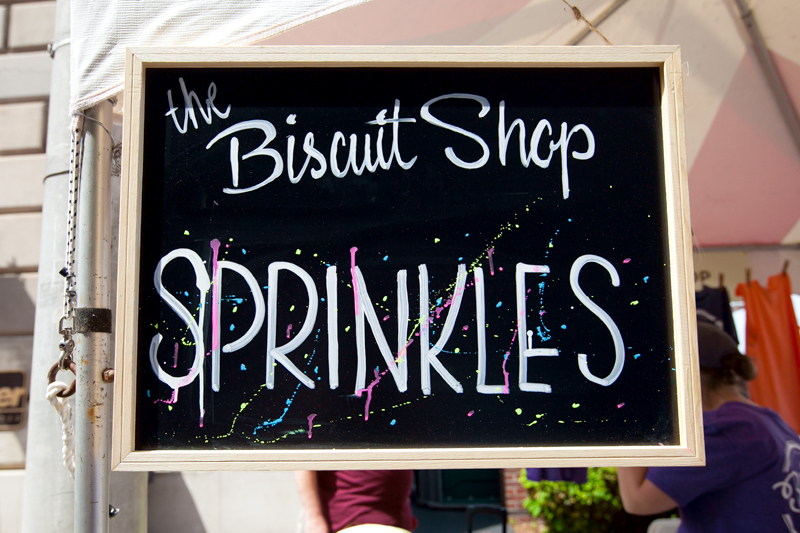 The Biscuit Shop from Starkville, Mississippi brought along their Sprinkles biscuit, which is a regular on Michelle Tehan’s menu. I recommend visiting their site and reading a bit about their story and their business. I just adore small niche businesses that start with little more than intense love and passion for something and I hope The Biscuit Shop soars to great heights! 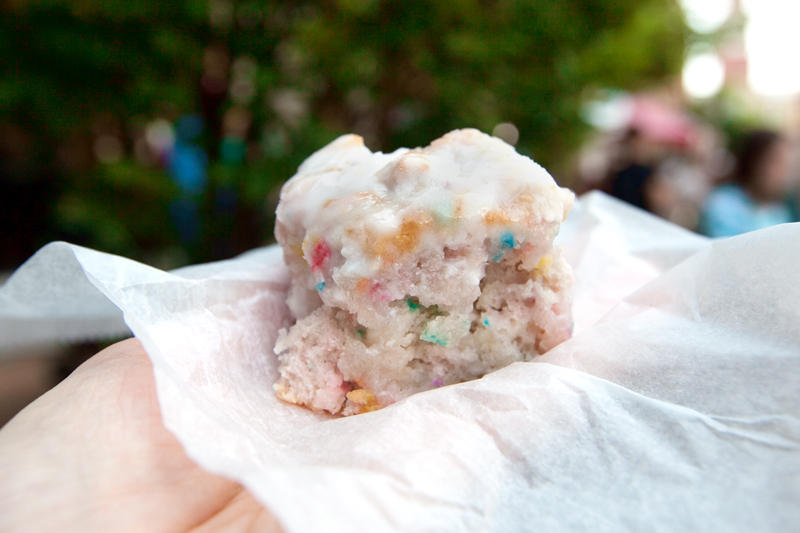 The Sprinkles biscuit was being referred to by our group as “the Funfetti biscuit” all day. In fact, I wanted to keep calling it a cake because doesn’t it look like a sweet-lovers dream? The fun colorful sprinkles and that sugar glaze could have had me fooled. Once biting into it, though, it certainly had the chewier texture of a biscuit. 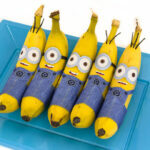 As a long-time lover of sweet breakfast confections, I thought this was an adorable and fun idea. 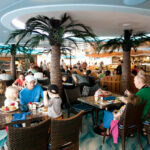 Photo credit: K&R Adventures – our dear friends and fellow food lovers! 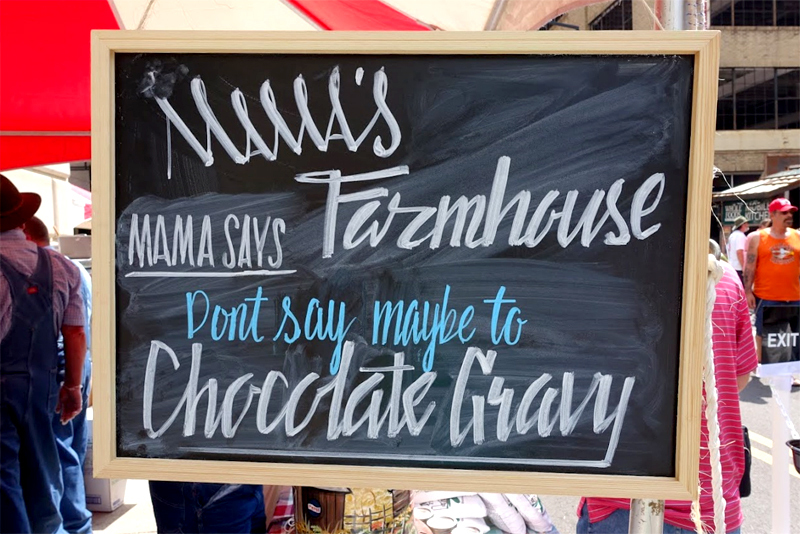 The last biscuit we tried was from Mama’s Farmhouse – the Mama Says Don’t Say Maybe to Chocolate Gravy biscuit. 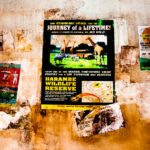 The name just kills me – I love it! 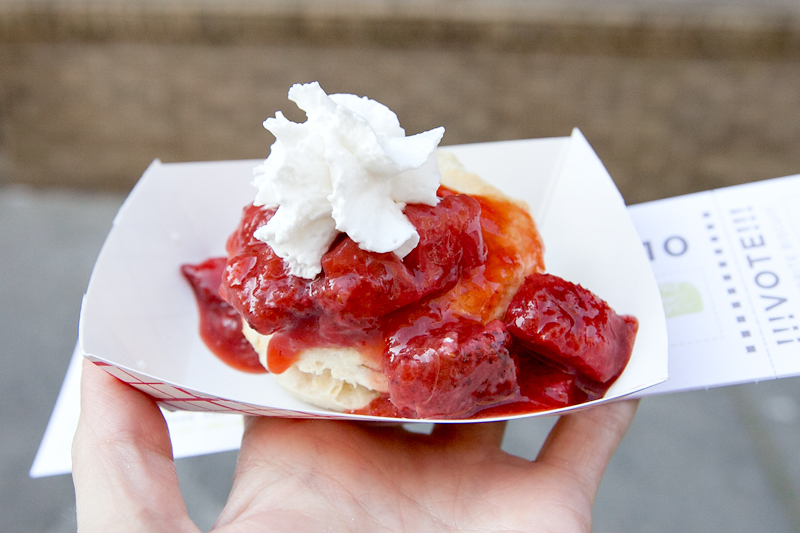 Their biscuit was topped with a fresh strawberry sauce and chocolate gravy and finished with a dollop of whipped cream and fresh strawberries. People’s Choice (tallied from the voting jars at each booth): Mama’s Farmhouse with the “Mama Says Don’t Say Maybe to Chocolate Gravy” biscuit. C’mon, we gotta give our own personal reward for our favorite biscuit, right? 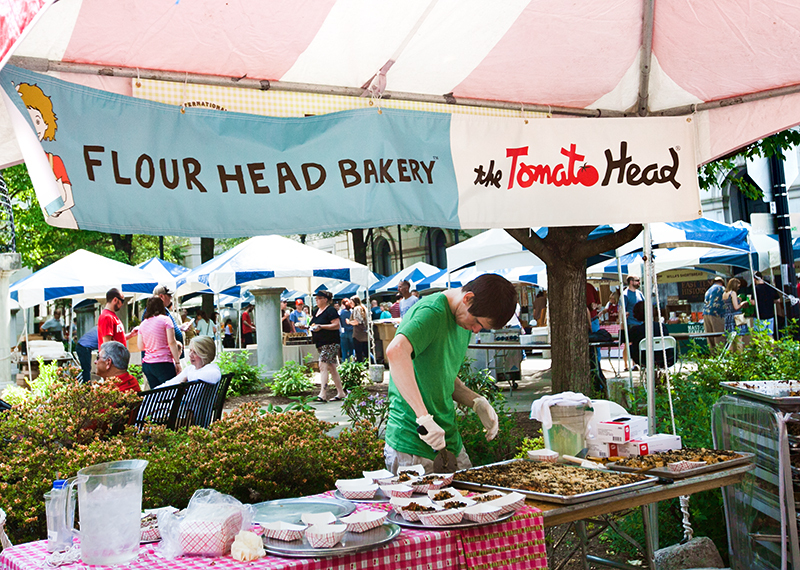 Without further ado, the winner of the 2015 International Biscuit Festival Brownie Bites Choice Award is The Tomato Head/Flour Head Bakery! Matt and I absolutely loved “The Jewel”. 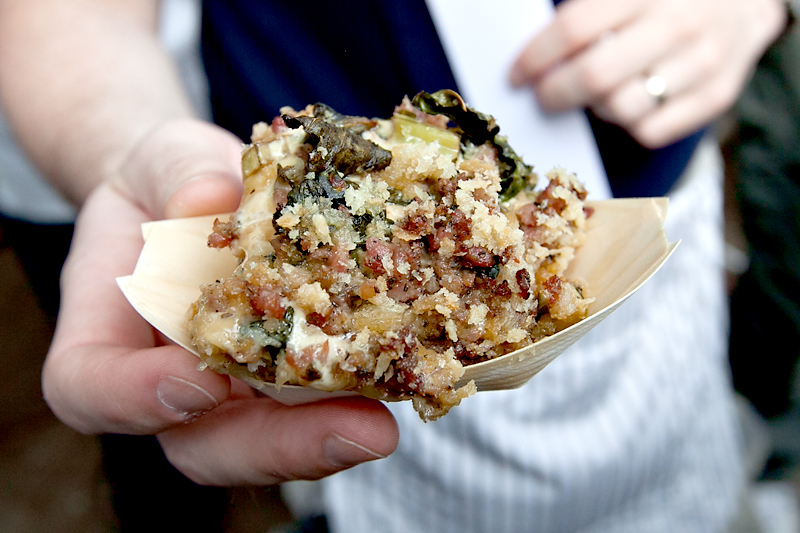 With it’s sinfully buttery and soft biscuit and the loads of flavor in the Benton’s sausage and collard green topping, we both agreed unanimously that it was our favorite biscuit of the year!